If I told you that more people in the world own a mobile phone than a toothbrush, would you believe me? Well you should, because it's shockingly, and perhaps disgustingly, true. I don't tell you this as a reminder on the importance of oral hygiene, but rather to remind you of the importance of having a mobile presence if you want your business to found online. According to Search Engine Watch, 60 percent of consumers use mobile exclusively to make purchase decisions. If you want to be seen by over half of your potential customers, you must understand how your advertising strategy changes across devices. According to Marin Software, “Mobile devices continue to become more prominent in the consumer shopping experience with nearly one-third of paid search conversions coming from tablets and smartphones.” During the 2014 holiday season, marketers used 49 percent of their budget for paid search on tablets and smartphones. This increase in spend demonstrates the overall increased use of smartphones and tablets in purchase decisions. If potential customers are on mobile devices, that’s exactly where you need to be! Where Does Mobile Fall in the Buying Cycle? Some advertisers may be discouraged by the statistic of only 30 percent of mobile searches turning into conversions; however, it is important to keep in mind the overall impact of mobile advertising. Clicks may convert to in-store purchases or may be saved as a reference for later. Catching a consumer’s eye upon the initial search could attribute to sales in the long run. Business Insider predicts that mobile ad spend will top $42 billion in 2018. The data looks at a variety of mobile ad formats including display, video, social, and search. Is Mobile Important for my Industry? Some industries will benefit more from mobile ads than others, specifically retail and contract services. Emergency services (plumbers, towing companies, etc.) are also a great match for mobile paid advertising. Even if your business isn’t the type that seems to make sense for mobile advertising, consider this stat from Think with Google, “90 percent of smartphone users have used their phone to make progress toward a long-term goal or multi-step process while ‘out and about.’” Google is now referring to these as “micro-moments” where people are pursuing big goals in small moments. This means that consumers are constantly making small decisions that eventually will lead to bigger decisions; make sure your business is there from the start. What’s the Difference between Advertising on Mobile vs. Desktop? Let's look at two examples. 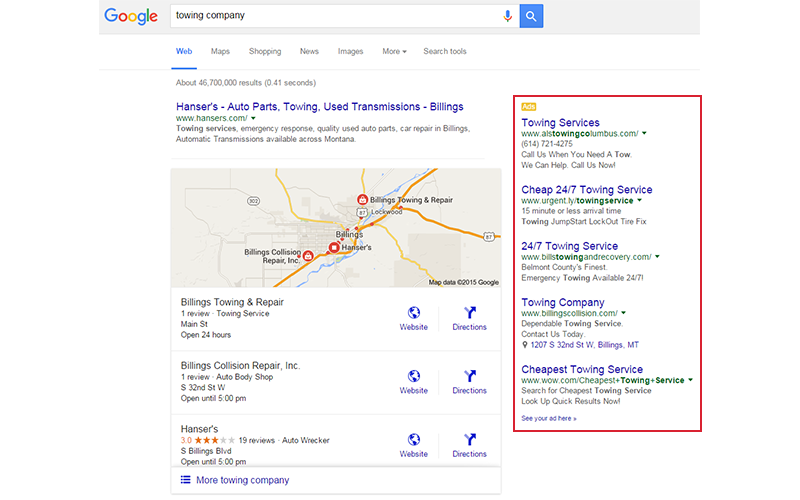 In the first example, we searched for a towing company on a desktop (after changing our location to Billings, Montana). In this search you can see the ads are showing, but only on the side of the results page (it's also possible for ads to appear in the top two places above the map). The first page on desktop is largely dominated by local search results. Now let's look at the same search on mobile. In this search you can see that the top two ads take up the whole screen. When a user is searching on a mobile device they don’t have the time or the patience to scroll through pages of results. The top results are going to catch the consumer’s eye and get the clicks. 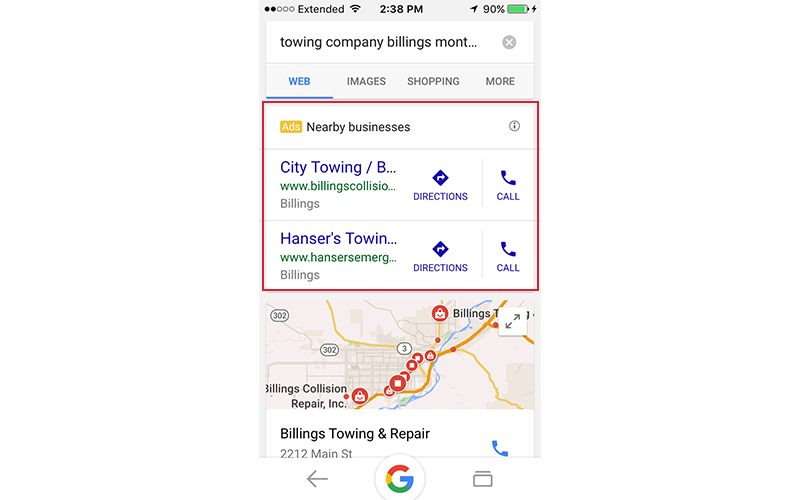 Mobile ads also have the click to call extension so users can call directly from the search. One reminder with advertising on mobile is the importance of having a mobile optimized landing page for the users to go to. If someone clicks on your ad and can hardly navigate around your website, it may cost you a potential sale. Still not convinced that an investment in mobile advertising is worthwhile for your business? Take a day and calculate how many times you use your phone. Being more observant of your own behavior will help you realize the huge opportunity you have to reach consumers, who just like you, are constantly on mobile devices. Once you are aware of your own habits you’ll realize that mobile advertising will be one of the best investments you can make in your business at this point in time. If you want to be ahead of the game, you’ll do it now — so grab your cell and let’s get started!